I have been absent for so long as I first recovered from my breast cancer. Then when we got the all clear my husband and I hit the road for a long awaited trip around Queensland to include Mt Isa and Cape York. We are still on the road but I thought it was time I posted an update to inform you all of my recovery at least. I did have to have a partial mastectomy though that sounds so dramatic for the little bit that they took out. Still it was surgery and one that potentially saved my life. I was extremely fortunate in that the surgery took all of it and I did not require chemotherapy at all. I will need to have yearly check ups but I have been cleared for now. For those that want the nitty gritty details I had DCI: Ductal Carcinoma In Situ. Thankfully it is the most common non invasive breast cancer there is. 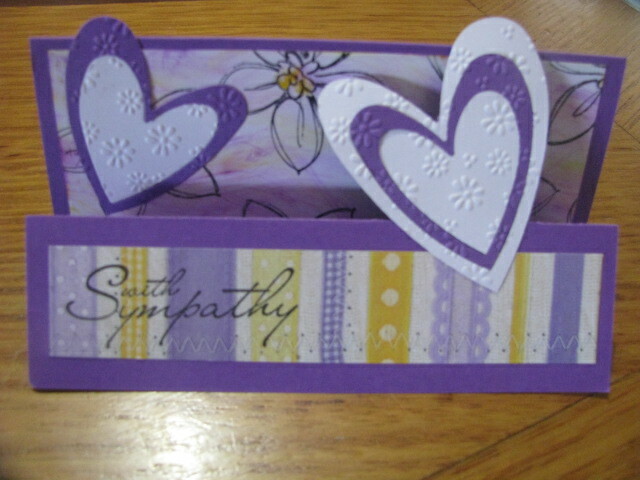 Now to move on back to crafts, here is a lovely z fold card I made for a friend. I hand stamped and coloured the back decorative paper to match the commercial stripey paper I had in my stash/ The hearts were cut and embossed on my trusty cuttlebug and layered. Hopefully we will keep in touch more from here on. By the way you can read about our trip on my Robbiebago travel blog. Thank you Vicki. It is good to get the clear from the doctor. We are enjoying our road trip. Glad to see you back in blogland. As usual your work is wonderful. Are you staying home and going to be doing more crafts again for us to look at? BTW Congrats on being a breast cancer survivor. I want to go over to your travel blog and read what you have been upto as well another day. 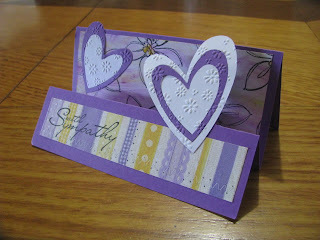 Love you card and the scrap book album. Can you show more pages of your album as promised now that you are better? Thank you, Jenny for welcoming me back. We will be based at home a bit more for the next 6 months as my hubby has a new hobby of converting a bus into a motorhome. You can read about that on the Robbiebago site. As for more crafts, yes, I ahve started to write them up. I have been productive whilst we were on the road, but sadly I didn't write anything up. Keep coming back as I slowly bring everyone up to date with what I have been doing. Thanks for note on my health. everything is terrific in that area. Just need to do yearly check ups! Hi HoneySue, What a,lovely name. I have done very little on the scrap book but there is another page finished. I should at least get that post sorted and tha might just give me the kick in the behind that I need to get going with some more.